Treatment for increased durability on residential streets, arterials and collectors. eFlex ES is a premium slurry seal emulsion. It is mixed with crushed aggregate, mineral filler, water and other additives, and is simultaneously applied using a mobile mix paver. Due to its high level of polymer modification, eFlex ES provides increased durability over conventional and modified slurries, and also ensures a longer lasting high-friction surface. eFlex ES is high-temperature tolerant and is suitable for use on residential, collector and arterial streets. It provides protection from distresses sometimes seen in conventional systems such as power steering burns and other damage caused by passenger vehicles and utility vehicles such as school buses and trash trucks. It also provides long-term protection from repeated activities such as snowplowing. 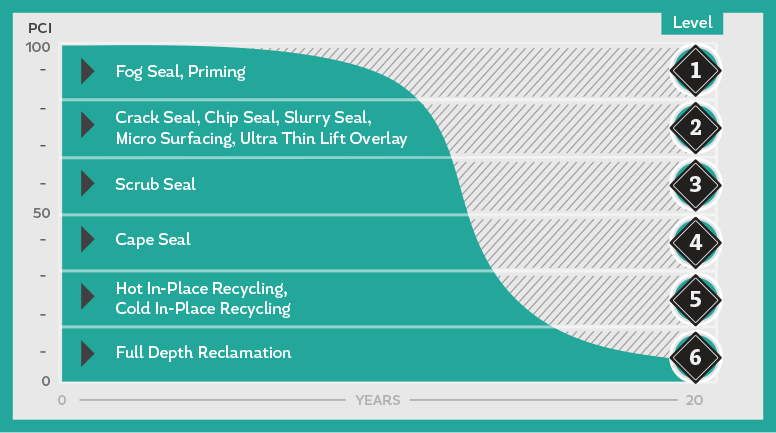 At an average cost of $2.75 per square yard, premium slurry seal allows for a life extension of roughly six to eight years at a fraction of the cost of a mill and fill treatment. While eFlex ES can be used to fix minor distresses and level road profiles, it is recommended that cracks ¼” or greater be sealed prior to application. eFlex ES is Ergon Asphalt & Emulsions’ premium slurry seal treatment. Ensure spreader box has augers or paddles to keep the mix moving. If required, use high-quality patching material and methods. Remove thermoplastic stripes and markings prior to application. Consult the ISSA Inspectors Manual for guidance.